Anker A7103 Micro USB Cable/ Android Devices, 3Ft. Anker A 7103 Micro USB Cable. For Android Devices & more. Works With Virtually ALL Android & Windows Phones & Tablets. PowerPort 2 Elite. At Anker, we believe in our products. That's why we back them all with an 18-month warranty and provide friendly, easy-to-reach support. Travel Ready: Compact design, foldable plug and 100-240 volt input are ideal for worldwide travel. This is a brand new charger. It was bought as a part of a lot of open box specials. It does not have its original packaging, but it has never been used other than me plugging two devices in the ensure proper working order. 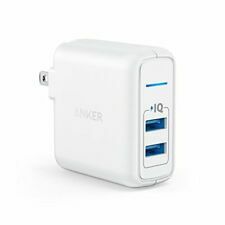 Anker Elite USB Charger, Dual Port 24W Wall Charger, PowerPort 2 with PowerIQ and Foldable Plug, for iPhone Xs/XS Max/XR/X/8/7/6/Plus, iPad Pro/Air 2/Mini 3/Mini 4, Samsung S4/S5, and More ---The Anker Advantage: Join the 20 million powered by our leading technology. ---Less Time Charging: Patented PowerIQ and VoltageBoost technologies charge any device at its fastest possible speed, up to 2.4A. (Does not support Qualcomm Quick Charge). ---Durable Design: Robust textured casing and premium internal components ensure perfect performance regardless of scrapes, bumps, or drops. Experience the Anker products supported by over 6 million people. IPhone 6/6 Plus / 5 S / 5 C / 5, iPad Air / Air 2, iPad mini / mini 2 / mini 3, iPad 4 th generation, iPod nano 7 th generation, and iPod touch 5 th generation. Anker A 7103 Micro USB Cable. For Android Devices & more. Works With Virtually ALL Android & Windows Phones & Tablets. Unibody Construction. Returns from major retailer. Flawless condition. As new and tested. OPEN BOX. Distressed packaging. Satisfaction guaranteed. Free shipping! Anker Lightning Cable for Ipod, iphone, ipad (3 ft) Brand New! I’m happy to help. It was tested. For the disconnection, now much stronger than the conventional cable. Apple MFi certification: in one single cable, you have chip to prove the approval by the independent serial number and Apple was is granted. That makes it much stronger than conventional cables. At Anker, we believe in our products. That's why we back them all with an 18-month warranty and provide friendly, easy-to-reach support. PowerLine Lightning. First Lightning USB cable history that has been reinforced with bulletproof Kevlar fiber. Anker PowerLine is now much more robust than conventional cable. PowerLine Lightning USB cable. Apple MFi certification. Anker PowerPort Solar. When you're out enjoying the great outdoors, enjoy another perk: free limitless power. Industrial-strength PET plastic faced solar panels sewn into high-wear polyester canvas ensure it's able to withstand the trials of your outdoor adventures. Black Anker Bluetooth wireless keyboard. Item has been opened and is not in box but is in good condition and works. Anker cargador USB para auto PowerDrive 2 (24W / 4.8A, 2 puertos) Condition is New. Shipped with UPS Ground (1 to 5 business days). History's first lightning USB cable reinforced with ballistic Kevlar fiber. Apple MFi authentication. iPhone 6s / 6s Plus / 6/6 Plus / 5s / 5c / 5. iPad Pro / iPad Air / Air 2, iPad mini / mini 2 / mini 3 / mini 4, iPad (4th Generation). PowerPort 2 Elite. At Anker, we believe in our products. That's why we back them all with an 18-month warranty and provide friendly, easy-to-reach support. Dual USB ports pump out 24 watts. Travel Ready: Compact design, foldable plug and 100-240 volt input are ideal for worldwide travel. "The choice of accessories should not be limited by the size of the cable.". High quality nylon fiber is comfortable and does not get caught. Condition : New. It has a length of 3.0 m and you can move it while connecting the device anywhere in the room. Mfg P/N 79AN7913S. Anker Astro Mini External Battery. "A charging station for the palm of your hand". One of the Most Compact External Batteries. Enhanced data transfer & charging cable with highly durable material. Anker PowerLine is much more robust than traditional cables. PowerLine Micro USB. The world's fastest and lasting data transfer and charging cable. Anker PowerPort II (2 Port) 49.5W w/ 6ft PowerLine+ II Lightning Connector NEW! ANKER PowerPort II PD 49.5 Watts. ANKER PowerLine II 6ft. Superior Safety: Anker's MultiProtect 11-point safety suite provides complete protection for you and your devices. Apple Certification: MFi certified for flawless compatibility with Apple Lightning devices, ensuring the highest possible charging speeds. A first for USB charging cables, the Anker PowerLine is reinforced with bulletproof kevlar fiber. Apple MFi Certification. iPad Air / Air 2 / Pro, iPad mini / mini 2 / mini 3 / mini 4, iPad (4th generation). Anker PowerLine Lightning Cable (3ft) with Pouch, Nylon Braided Charging Cable for iPhone, iPad and More (Red). At Anker, we believe in our products. That's why we back them all with an 18-month warranty and provide friendly, easy-to-reach support. Anker Lightning to USB Cable (3ft / 0.9m) for iPhone 6s. iPhone 7 / iPhone 6 Plus / 6 / 5s / 5c / 5 iPad Air 2 / Air, iPad mini 2 / mini. Length: 3ft / 0.9m. chip issued by Apple to ensure 100% compatibility with any Lightning device. Anker 60W 6-Port USB Wall Charger, PowerPort 6 for iPhone X/8/7/6s/Plus, iPad ..
Ultra Powerful Six ports pump out 60 watts of power, enabling simultaneous multi-device charging. High Efficiency Rated DOE 6 highly energy efficient by the US Dept. of Energy. For Optimal Use: - Use your original cable or a third-party certified one (such as MFi). 5 out of 5 stars - Anker 60W 6-Port USB Wall Charger, PowerPort 6 for iPhone X/8/7/6s/Plus, iPad ..
1 product rating1 product ratings - Anker 60W 6-Port USB Wall Charger, PowerPort 6 for iPhone X/8/7/6s/Plus, iPad ..
Cutting-edge Qi inductive technology. Samsung Galaxy Note 5, S7 / S7edge, and S6 edge . Adapter must be used for the power input. Simple Charging Wire-free charging for our grab-and-go world. • Remove protective cases to see effective charging. PowerLine minimizes cable resistance, allowing optimum charging for any USB device. PowerLine Micro USB cable. PowerLine will be the last cable you need. High endurance premium Micro USB cable. PowerLine Micro USB cable. PowerLine will be the last cable you need. PowerLine minimizes cable resistance, allowing optimum charging for any USB device. High endurance premium Micro USB cable. Anker will have absolute confide. 2 port, it can be output of 24W 4.8A. Ideal for travel: compact design with folding. input 100-240V ~ 0.7 a 50-60Hz output 5V == 4.8A (2.4A max each port). - state-of-the-art fast and safety by charging. Anker 1 f Powerline Premium Durable Lightning Cable. PowerLine may be the last cable you'll ever need. PowerLine is built to withstand any yanking, twisting, stretching. Wind up PowerLine and bind it using the adjustable velcro strap for. Anker 3ft Powerline USB Type C Cable. PowerLine may be the last cable you'll ever need. To suit any situation. Charging close to the wall?. Wind up PowerLine . The Premium Nylon-Braided Cable. Customizable Cable Length. Warranty Info Part No. Vendor: Anker. Output: 5V=12A(2.4A Max Each Port). The 6 Port USB Charging Hub. Colour: White. Compact and lightweight for maximum portability. Optimised charging for any device. Anker PowerLine cable 0.9m white USB-C USB-A 3.0 Galaxy S8 MacBook Xper... new. It also cannot be used at 220V-240V. The plug type in Japan is type A. If a conversion adapter can handle the electric power, all you need to do to use the product in your country is to change the plug to type A. 5 out of 5 stars - Anker PowerLine cable 0.9m white USB-C USB-A 3.0 Galaxy S8 MacBook Xper... new. 1 product rating1 product ratings - Anker PowerLine cable 0.9m white USB-C USB-A 3.0 Galaxy S8 MacBook Xper... new. < b> Anker PowerPort 4. full speed charging technology. - state-of-the-art high-speed and safe charging. [ Release Date(yyyy/mm/dd) ]. very compact. [ Multiple sizes and colors ]. Japan Usage Item. [ Electronics ]. PowerPort 5 USB-C PD. Also supports rapid charging to iPhone X / 8/8 Plus. - Samsung Galaxy TabPro S. USB PD output: 5 V == 3 A / 9 V == 3 A / 15 V == 2 A / 20 V == 1.5 A. PowerIQ output: 5 V == 6 A (each port maximum 2.4 A). Fast and safe charging using leading-edge technology. trust supports over 20 million quality durable final PowerLine That will be the last cable you need. Felt pouch PowerLine access to specially designed felt pouch is included. Anker PowerLine Micro USB cable 0.3m red double weaving high durability Japan. PowerLine minimizes cable resistance enables optimal charging for any USB device. Data transfer is likewise high speed. Depending on the application you can easily adjust the length of the cable. 4.5 out of 5 stars - Anker PowerLine Micro USB cable 0.3m red double weaving high durability Japan. 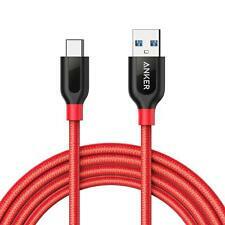 9 product ratings9 product ratings - Anker PowerLine Micro USB cable 0.3m red double weaving high durability Japan. Compatible Model : Universal. - I will send the goods from Japan. It seems to be take about 3-5 weeks until it arrives to you. The tip connector of PowerLine may interfere with your case. (Width: 12.3 mm, height: 7 mm). - Galaxy S8 / S8 . - Sony Xperia XZ. owerLine USB-C & USB 3.0. High endurance premium cable. - Quality of trust supported by over 20 million people. 0.9 m high-durability nylon Micro USB cable at high speed in charging and syncing. High-quality nylon feels well, of trapping gloves. Compatible with the case: Compact connector head, available in most large and small cases. PowerLine may be the last cable you'll ever need. PowerLine 's plastic head may be incompatible. Samsung Galaxy TabPro S. or other USB-C devices via this cable. That's an HD movie or over 1000 songs every 5 seconds. Compatible with: Apple iPhone 6 Plus, 6S Apple iPhone, Apple iPhone 6S Plus. Long-lasting and PowerLine lightning USB cable world's fastest data transfer. If you get it as quickly as possible.